Nerd Block is a subscription mystery box that delivers geeky collectibles right to your door each month. You can choose whatever theme box you are into–there’s the Classic Block, Arcade Block, Sci-Fi Block, Horror Block, Comic Block, and even a Boys Jr. and Girls Jr. Block for younger kids. The sets always includes a t-shirt, along with 4-6 other collectibles that are often exclusive to Nerd Block subscribers. 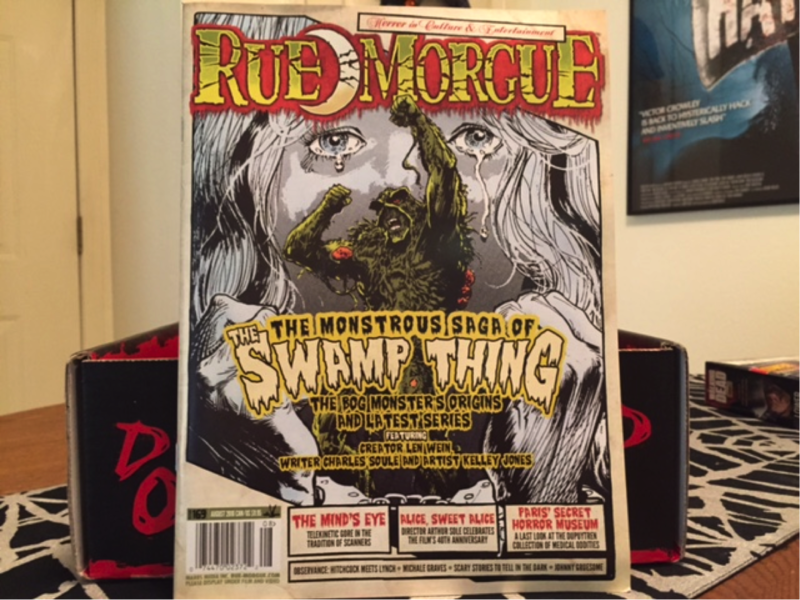 After six months of some wonderful horror treats, I happily decided to keep my subscription. Today I am unboxing the July 2016 Horror Block. It was a bit of a lackluster occasion opening up the July 2016 Horror Block. Don’t get me wrong–none of the items I get in these blocks are ever unwelcome or bad at all. It’s just that nothing really had that “wow” factor for me this month. Take, for instance, this building set from The Walking Dead. Though I’m a fan of the show, I’m not really a big fan of this type of collectible. 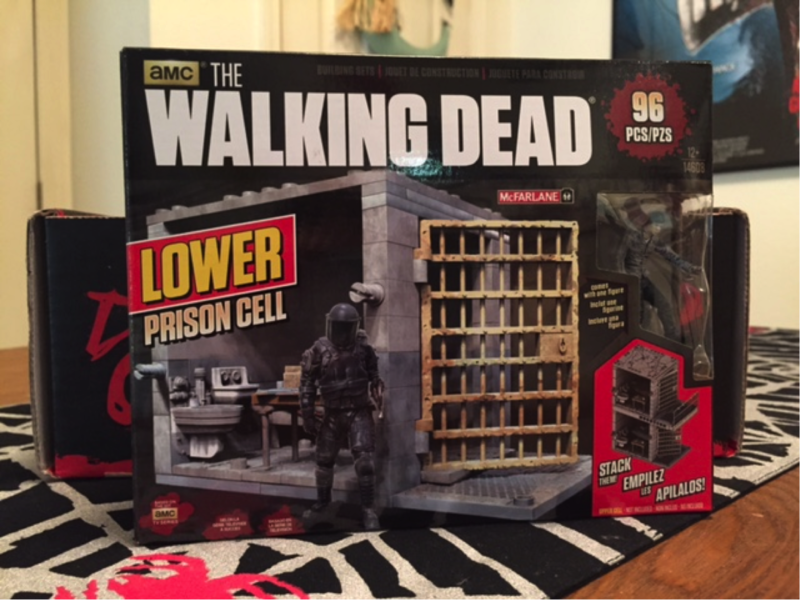 This particular set is of a lower jail cell from the prison in season 3, and comes with a small figure of Carl. Other sets are sold separately to create much more of the prison and other famous locations from the show. Horror Block had teased to us before that July’s box would have something from The Simpsons’ Treehouse of Horror, and I could not for the life of me think of what that might be! It turned out to be this kind of adorable art print of Marge, Homer, and Bart in the style of The Return of the Living Dead poster. 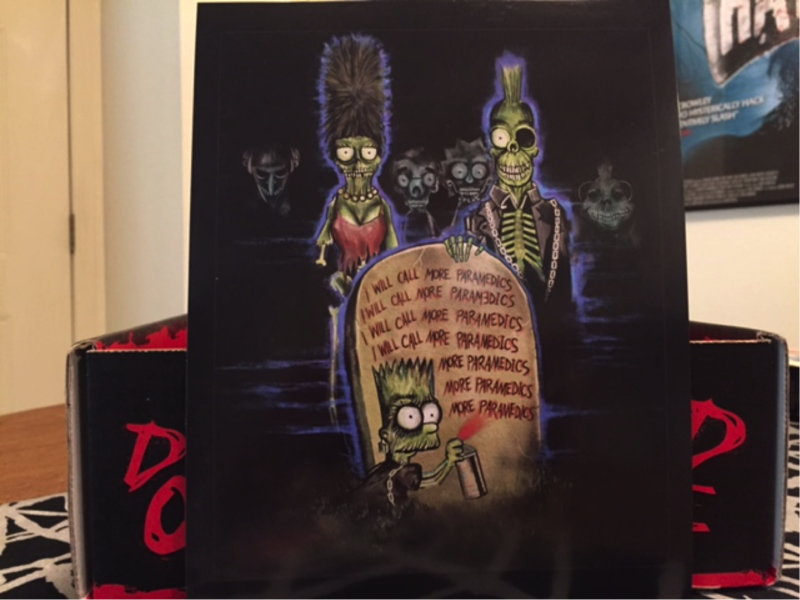 It’s a nice goof on both the show and the movie by having Bart spraypainting “I will call more paramedics” over and over again on the gravestone. There’s no artist ascribed to this print, but whoever created it is a genius. Next up in the block is the monthly Blu-Ray selection. The information card for the block says that this month was sort of a grab-bag type deal with the Blu-Ray, with there being several choices of what subscribers could possibly receive. 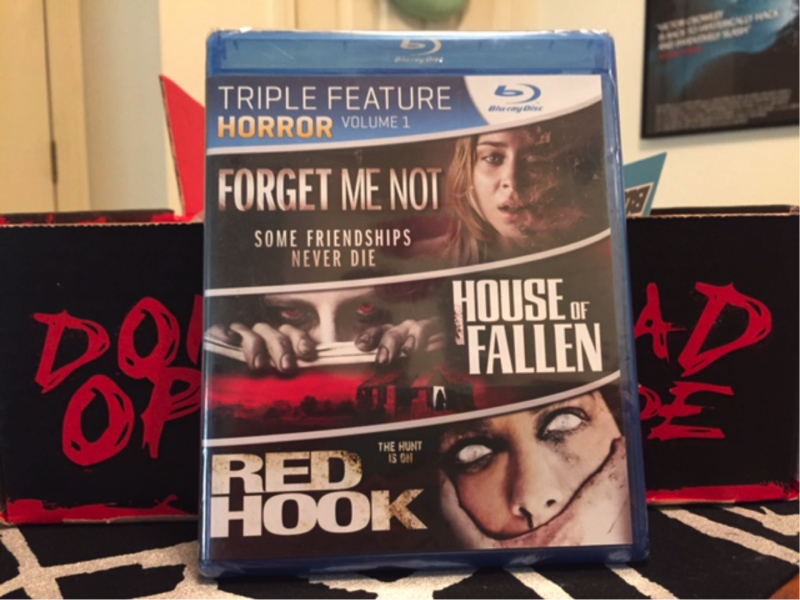 I got this triple feature pack that includes the films Forget Me Not, House of Fallen, and Red Hook. From the back of the Blu-Ray: “In Forget Me Not, Sandy the popular class president of her high school must fight for her life after discovering the secret behind her friend’s disappearance. Follow The Watchers, a group of fallen angles in House of Fallen as they walk amongst the Earth disguised as humans torturing the vessels they inhabit. In Red Hook, Jenny and her friends decipher cryptic text message clues after joining a Welcome Week scavenger hunt that isn’t what it seems.” I can’t say I’ve even heard of any of these movies before, but I will definitely give them a watch sometime! There were two pieces of apparel in this month’s block. 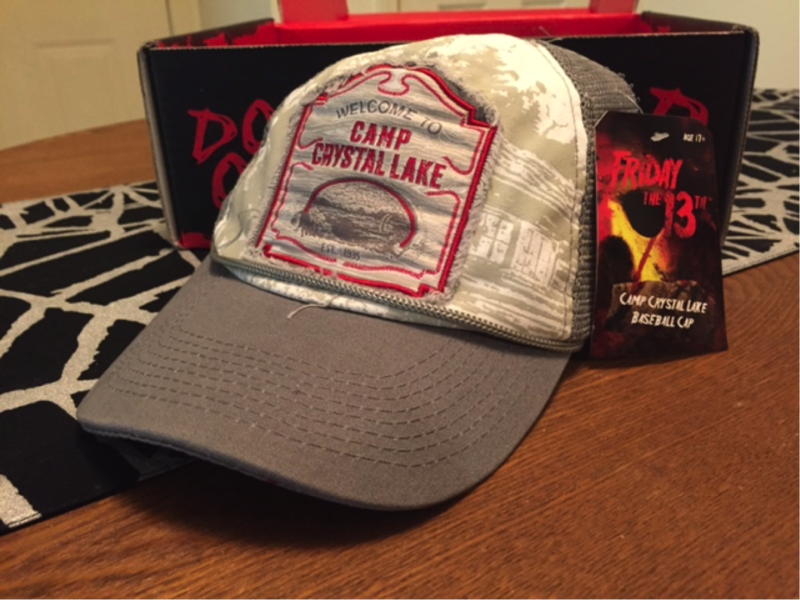 Aside from the regular t-shirt that we get every month, Horror Block changed it up with this Camp Crystal Lake baseball cap. I never wear hats, but I’m starting to reconsider my fashion choices, because this cap is cool. And there is more to it than what one picture can show: around the back near the size adjustment band, there is a little hockey mask pin. On the underside of the bill, there is some blood spatter and the words “Jason Lives.” Perfect for Friday the 13th and Jason fans. Lastly, we have the item that is quickly starting to push me out of house and home because of how many I have accumulated because of Horror Block–the t-shirt. 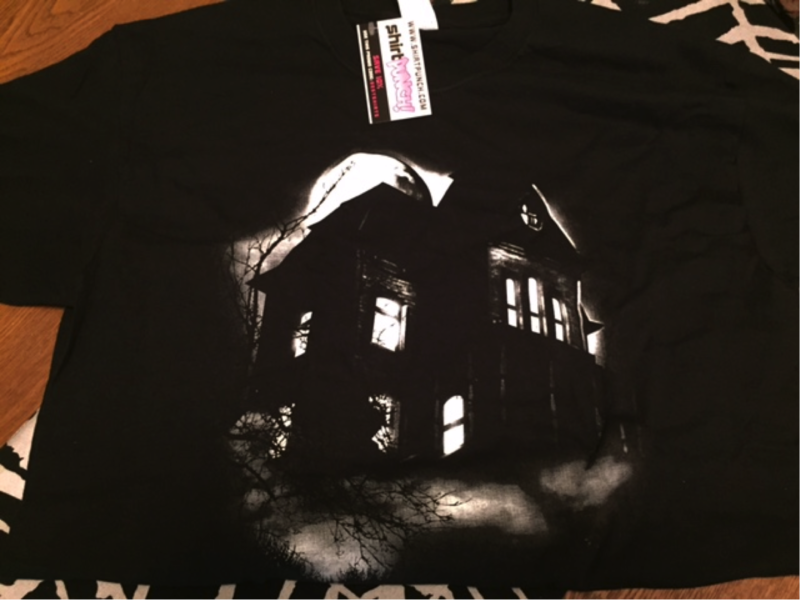 Once again courtesy of the company ShirtPunch, this exclusive shirt depicts a simple yet classic design of the Psycho house. Of course I love Psycho and of course I love black t-shirts, so I am more than happy with this item. The bonus quality of the shirt, though, is that it glows in the dark. I tested it, and it works. While it didn’t make me as excited as some more recent blocks, the July 2016 Horror Block is good. Stay tuned to see what horrors await in the August 2016 Horror Block, and if you like what you saw here, head on over to Nerd Block to start your own subscription today!